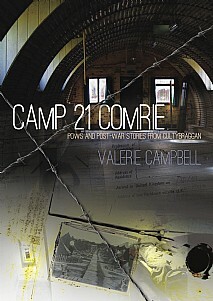 Camp 21 Comrie, also known as Cultybraggan Camp, is the UK’s best preserved prisoner of war camp. Lying in the heart of rural Perthshire in Scotland, the camp’s history is a fascinating one. Built two miles south of the village of Comrie as a camp for detainees, its first prisoner was a British soldier but in the following years it housed thousands of prisoners of war captured in North Africa and Europe. Conditions at the camp were primitive but there was a re-education programme which is explored in depth. Lectures were followed by occasional hot debates and the book takes a fresh look at the infamous murder of Feldwebel Wolfgang Rosterg, who may not have been the only man subjected to a fanatical show trial within the bounds of the camp. In addition, life stories of some of the prisoners are included, from submariners to ordinary soldiers as well as reminiscences from the British. The history of Camp 21 would be incomplete without mentioning Rudolf Hess, Adolf Hitler’s deputy. He was allegedly held at the camp but was he really there or was this just a myth? And do the ghosts of the past still haunt the site as reported by some who’ve witnessed strange goings on? The book also features the camp’s history during the Cold War, its ROC post and Cold War bunker and as late as the 1960s and ‘70s it was used by the Combined Cadet Forces for training purposes, as well as regiments that served in areas of conflict overseas. Following its closure it is now owned by the Comrie Development Trust. Camp 21 Comrie sets the camp’s place not only in history but also as part of an expanding community project, inspiring people and being utilised for good. This will be of especial appeal to all those interested in WWII and modern history, POW associations and anyone with local connections.